Jocassee Pumped Storage Station on the Keowee River, South Carolina. 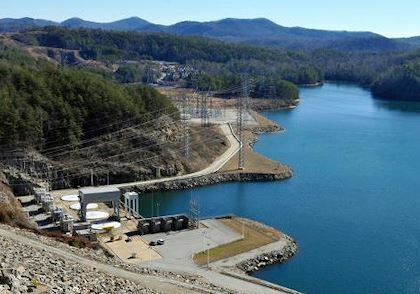 The Jocassee Pumped Storage Station, owned by Duke Power, is a 610 MW hydroelectric facility on the Keowee River, South Carolina. 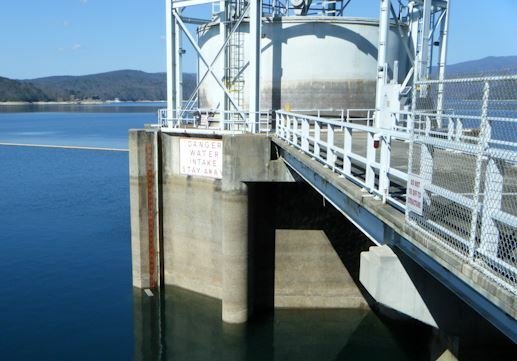 As part of the Keowee-Toxaway Hydroelectric Project’s Fish Assessment Study required by the Federal Energy Regulatory Commission, fish entrainment had to be monitored at Jocassee dam to determine the effect of the hydro operation on the fisheries in Lake Jocassee and Lake Keowee. The hydroacoustic system that was installed consisted of 4 Simrad 333-kHz sounder surface units, one at each intake tower to monitor entrainment during generation and two in the tailwater to monitor entrainment during pump-back operation. 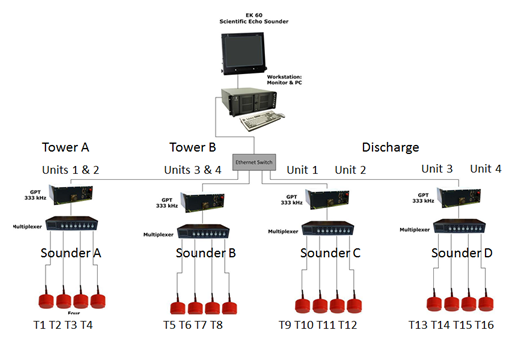 Each surface unit multiplexed 4 splitbeam transducers, a total of 16 transducers for the entire system. Acoustic sampling was triggered automatically by an electrical signal indicating the startup of a hydro unit and stopped when the unit shut down. One of the intake towers monitored for fish entrainment during generation. 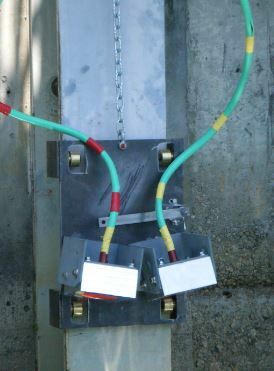 Two transducers mounted on a sled that is lowered into the tailwater for monitoring entrainment during pump back operation. Schematic of the hydroacoustic monitoring system. The acoustic data were analyzed with Echoview’s fish tracking module. The analysis involved automated fish tracking, a visual review of the tracking results and some noise editing. Tracked fish were classified as entrained based on several criteria that were taking into account the operational status of the unit that was monitored, the horizontal trajectory of the fish relative to the wall of the intake and its elevation relative to the top of the intake. To estimate the total number of fish entrained the number of tracked fish that met the entrainment criteria was expanded proportionately to compensate for the effective beam width relative to the width of the intake sampled, the proportion of intakes sampled at the time and the proportion of time sampled.